Our Chef has set to work for our enjoyment with new corvina recipes for the whole year. The first episode is starring an Italian dish, Ravioli Mediterranean way, with a tasty filling made with béchamel sauce and Corvina REX. For its preparation we propose to use Wonton pastry dough, a typical Chinese cuisine type of paste made of flour, water and salt. Also known as Wanton or Wantan you can buy it – in small packages of sheets – in specialized stores but you can also make this recipe with another type of dough and it will be equally delicious. We love the fusion and the idea of connecting Latin and Asian cuisines, we find it interesting for this recipe of white fish that will not leave anyone indifferent but we would love you to give your personal touch so, let your imagination fly and make yours every one of the recipes we propose. Sign up for the video-recipes! 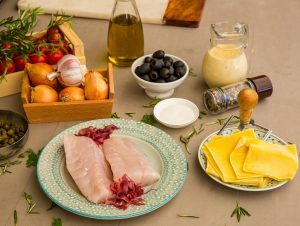 In this digital age, audiovisual format is king, so most of the new Corvina REX recipes from our website will be accompanied by a practical video so as not to lose any detail of its elaboration. If you thought you already knew all the ways to prepare Corvina REX, you are in luck because you still have much to see… and taste!. Let yourself be seduced by the flavor and the fine texture of this white fish from our coasts that has the Crianza de Nuestros Mares seal and offers infinite possibilities.